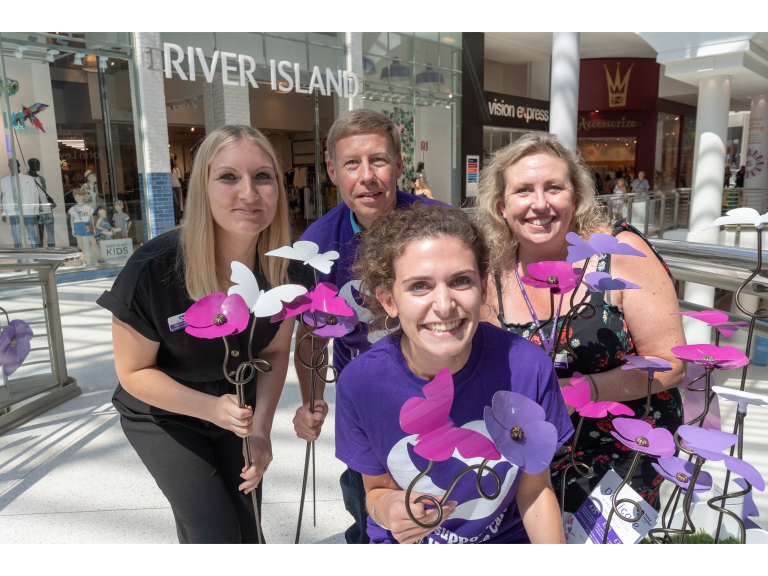 intu Watford’s display of hand-sculpted metal poppies and butterflies was unveiled in the summer and members of the public were invited to donate to Peace Care Hospice and dedicate a poppy or butterfly in memory of a loved one. Each individually sculpted garden ornament is made from metal and vibrant coloured enamel, including white, lilac and fuchsia butterflies, and purple, lilac and fuchsia poppies. The suggested donation for a poppy or butterfly was £25, but many people have paid more to help remember a loved one and support the Hospice, which looks after people with life-limiting illnesses and their families. The display has now finished in the shopping centre but people can still dedicate poppies and butterflies by visiting www.peacehospicecare.org.uk/poppyappeal. It’s the second year running that intu Watford has supported this appeal – with the butterflies being a new addition for 2018.